Reuters2, CNN3, Der Spiegel4 and others reported about the progress of this computer forensics5 investigation. News coverage continued into 2002. Four months after the disaster, Germany's TV channel ProSieben visited Convar's laboratory6 and documented the process of restoring data from one WTC hard drive. 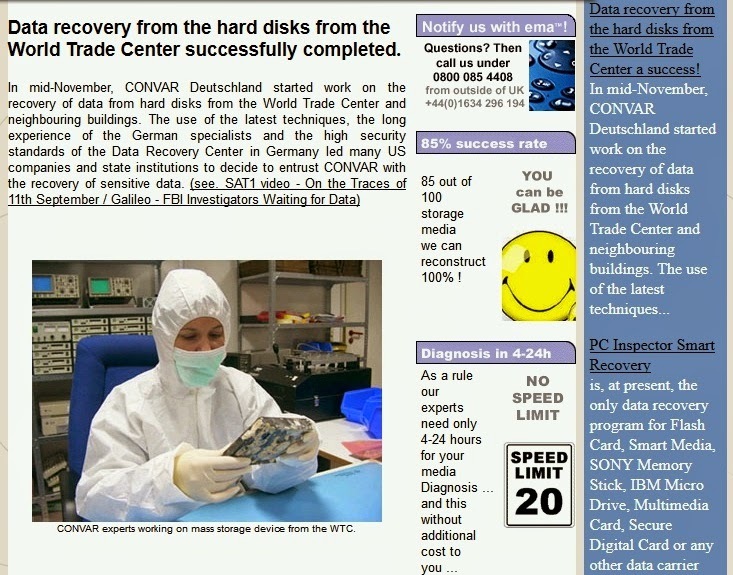 In March 2002, Germany's ZDF (Zweite Deutsche Fernsehen) in their ”Heute Journal” program visited Convar's laboratory, interviewing the employees and documenting the examination of WTC hard drives.7 It was reported that, by then, the company had already succeeded in restoring data from over 400 hard drives and that the drives had been sent by the U.S. Department of Defense (”Verteidigungsministerium”). According to an article in German technology magazine Techfieber, the hard drives were sent from the USA to Ramstein, Germany, and from there in a special transport to Pirmasens.8 The article notes that, on average, about 400 hard drives are processed in the laboratory every month. 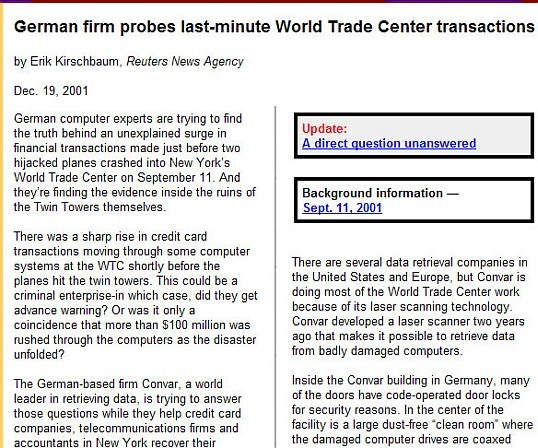 On September 11, 2002, German radio aired a program in which their team visited Convar's laboratory and interviewed the company's employees.10 The team understood that the employees were not allowed to mention Convar's U.S. partners, but they noted that the U.S. Department of Defense was marked as the sender of a hard drive shipment they saw. Based on the FBI's statement, in its final report published in 2004, the Commission did not mention Convar's widely publicized WTC hard drive investigations. The topic was also never again addressed officially, and it was dropped from mainstream media reporting. According to the CNN article, some other companies were also involved in the WTC hard drive data recovery effort.13 I contacted via email the author of the article, Rick Pereira, who was unable to recall – due to the long time that had elapsed since his reporting – what these other companies were. In line with the ”forgotten” Convar investigations, these research results have not even been discussed in mainstream media, let alone inspired any well-funded or well-publicized investigative journalism. Wing-Keung Wong et al (2010): Was there Abnormal Trading in the S&P 500 Index Options Prior to the September 11 Attacks?